Nov. 23 1915. C.F. W. C Cubs met at a called meeting, for unfinished business. Mrs. Christie presiding. Nine clubs answered to roll call. Minutes of last meeting read and approved. The report of the delegates in regard to Suffrage League was called for. The majority reported as favorable to whatever action the federation decided upon. Mrs. [Hibuer?] made a motion, second Mrs. English, that a mass meeting be called to decide the matter, outside of the federation. Carried. Mrs. Lothian moved, Mrs. Owen second, that mass meeting be postponed until after Jan 1st. Carried. A letter was read from Mrs. Horne, asking for money for Loan and Scholarship fund. Also a letter asking for $1.00 for Woman's Shelter, Chicago. No action was taken. 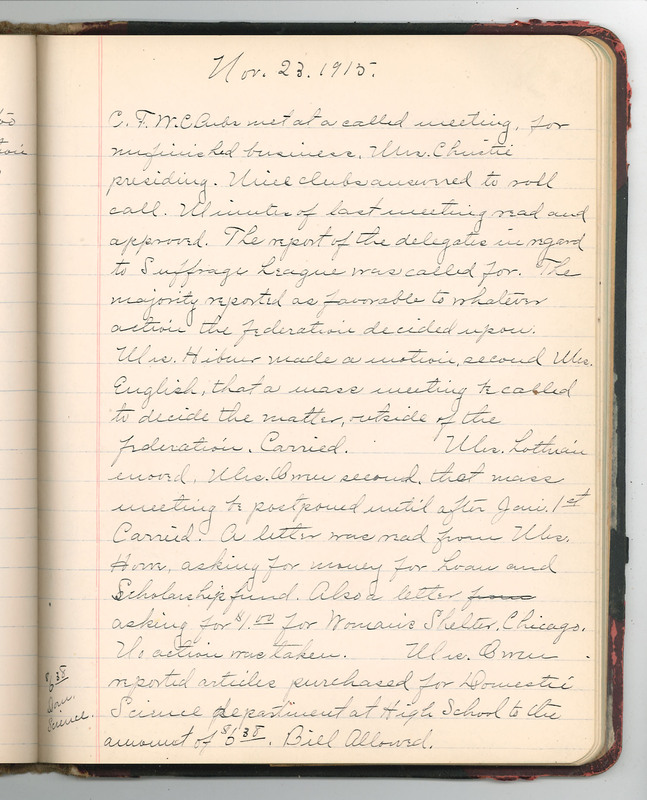 Mrs. Owen reported articles purchased for Domestic Science department at High School to the amount of $6.38. Bill Allowed.